This article is about understanding Fibre Adaptor Panels (FAPs). What is a Fibre Adaptor Panel/Fibre Through Adaptor? Through adaptors and FAPs (fibre adaptor panels) are also not difficult to understand. As the name suggests, a through adaptor is basically a double sided female connector that allows two terminated fibre runs to be joined together. The tricky part about through adaptors is that the terminology used to describe them can sometimes be confusing. Standard FOBOTs (like the one pictured on the left in the below image) are specifically designed to house one type of through adaptor directly into the FOBOT and will not accommodate for anything else. Modular FOBOTs (on the right in the below picture) however use a panel that is preloaded with through adaptors which then clicks into the FOBOT. 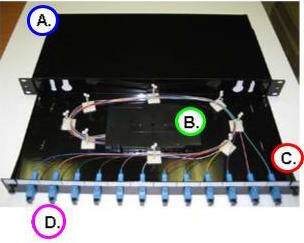 The benefit of a modular FOBOT is the ability to use multiple types of fibre connections in one tray. For example, you could accommodate one panel of LC connectors, one of SC connectors, and one of ST connectors all in the same FOBOT. Other items can also be used in FAP FOBOTS such as MTP cassettes & media converters. Hopefully, piece by piece, you can see the different Stronglink products needed to build a fully loaded FOBOT to whatever configuration your customers may require.